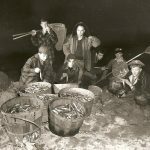 Smelt Fishing in Old Kenosha - The Works of Joe Campolo Jr.
I’ve gotten some very nice emails and notes regarding my perch fishing story in “Our Wisconsin” magazine. 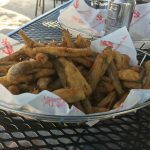 The story, which is also on my blog, recalls those “good old” days on Lake Michigan when we used to catch buckets of yellow perch throughout the spring and summer. Those days, unfortunately, are long gone as Alewives, Zebra and Quagga mussels, along with over fishing have decimated the yellow perch population in Lake Michigan. There is currently a daily limit of five yellow perch on the lake, and truth be told you’re often lucky to catch one. I recently had the opportunity to meet one of my readers and his wife. We had a good time kicking around the old perch fishing days along the Kenosha shoreline. 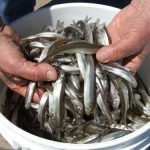 We also talked about those great days in the spring, many years ago when we would catch buckets of smelt which had come in to spawn. We’d catch buckets of them! The smelt run would usually start shortly after Easter. The little grunions would be in close to shore for about three weeks before heading back out to deep water for the rest of the year. Fisherman up and down the shores of the great lakes would lay in wait for them, when they would swim in close to shore at night to reproduce. The Kenosha harbor would be lined up with groups of people using dip nets to catch the tasty little buggers. The dip nets were composed of a large square net on a winch. The net would be lowered to the bottom and cranked up every so often to see if the smelt were “in”. 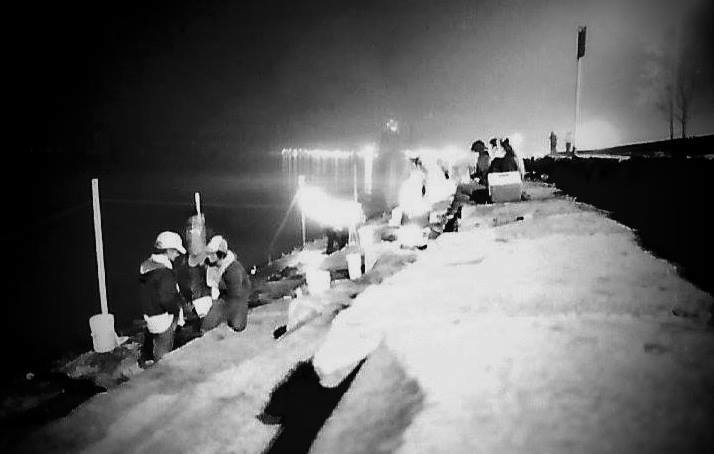 Once the smelt were “in” the nets would be cranked up and down frequently and groups of smelt would be scooped out of the net with a smaller dip net. A bright lantern or light was used to see what was in the net, and to also attract the smelt. 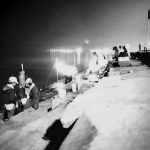 Dip nets were also used up and down the Kenosha shoreline in the “rocks” but it was not as easy to set-up and sure as heck not as comfortable as smelting on the piers. 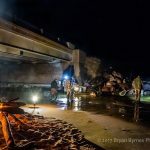 The smelt fishing parties were great! Many smelters used a sein net to catch the wily little critters. We had a thirty foot long sein which we would walk out into the lake with. After a short pause, the sein net would go down and we would tap our way back to the shore to hopefully find a net full of smelt. As I was usually the shortest guy in our “crew” I was the pivot man who held onto the net while the taller guy went out into the lake and swung around. Often, especially when the lake was rough, waves would break over our chest waders and we would get a good soaking. 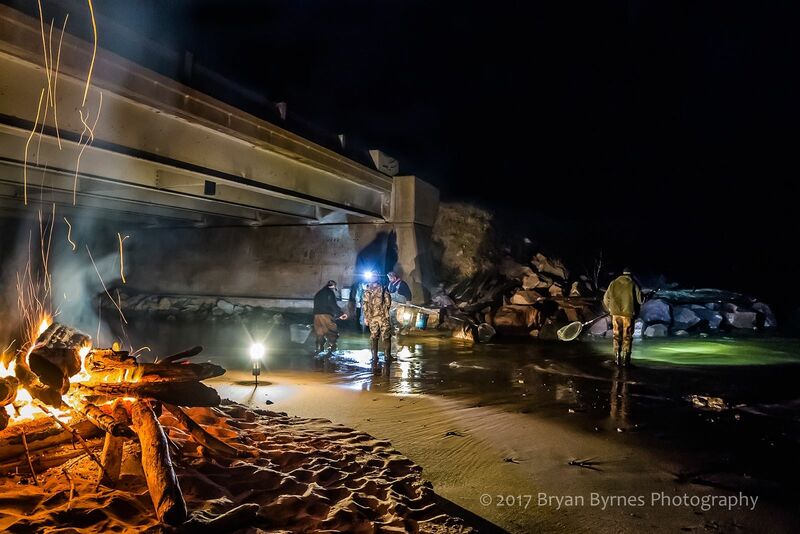 As Lake Michigan is never warm, especially on cold spring nights, this is when the alcohol we had consumed, along with our bonfire on shore earned its medal. Sometimes we’d catch em by the bushel! There were several locations where we seined in Kenosha; Eichleman Park, Simmons Island next to the north pier, and Barnes Creek in Carol Beach were our favorite spots. 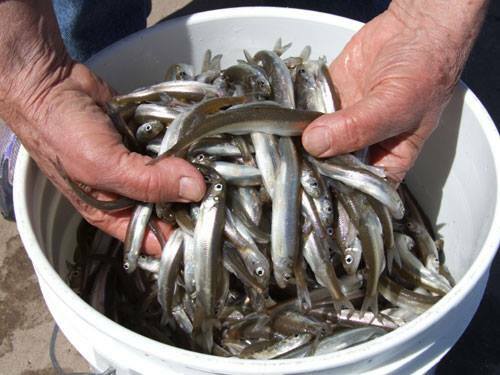 Sometimes we’d catch so many smelt that we would drop off buckets of them off at local taverns on our way home. This, of course, was rewarded with many refreshing beverages; and extended the smelt fishing party. Once home everyone got to work cleaning the smelt. The method to cleaning smelt involved a scissors and your thumb. The smelt would be cut open from the belly to the gills. The guts were squeezed out by inserting the thumb and running it through the length of the open smelt. The smelt cleaning operation often ran well into the next morning, depending on how well we did. Of course, the consumption of various beverages continued during the cleaning procedure and also after wards, as a batch of fresh smelt would be battered and fried. 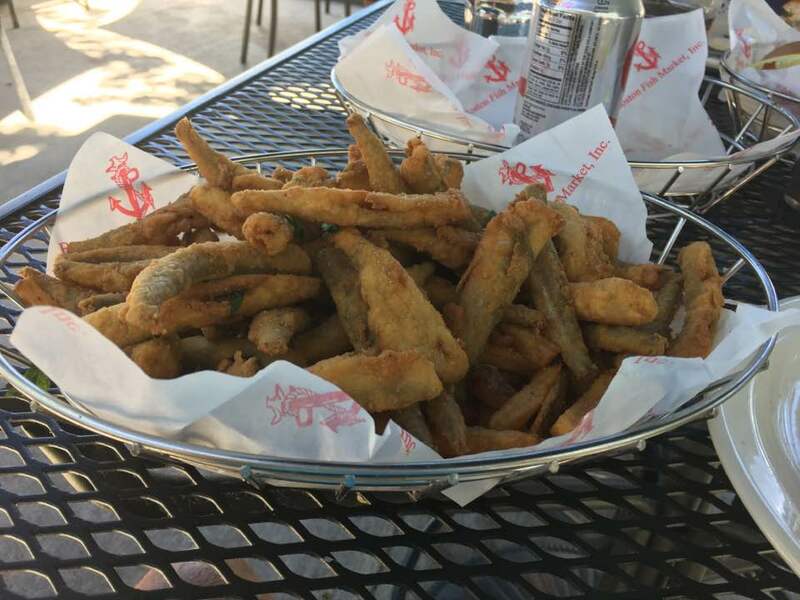 As with the perch, fried smelt would be served with coleslaw, bread, and the beverage of your choice. Finer dining was never had!! And, unfortunately the same factors that caused the decline of the lake perch also caused the disappearance of the smelt in the southern portion of Lake Michigan. 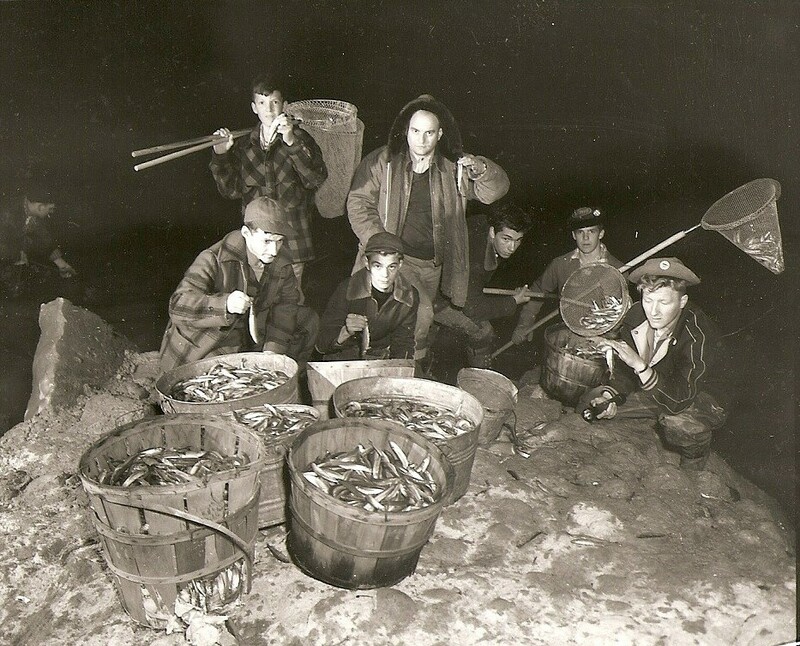 However as a testament to the popularity of the event, every spring parties are still held at night in many former smelt fishing locations; albeit without the guest of honor… the smelt. Hopefully out there somewhere dipping their nets into the “heavenly waters”. Really enjoyed your story about smelt fishing – sounds like a good time. Too bad the perch and smelt are gone because of over-fishing. Thanks Pat, good to hear from you! Good read, did smelting once, great experience, hope it comes back. Thanks John, glad you enjoyed the story. Smelt fishing was the best part of spring; really miss it.